Mirzaei, M., Ahadi, H., Shariaty-Niassar, M., Akbari, M. (2015). Fabrication and Characterization of Visible Light active Fe-TiO2 Nanocomposites as Nanophotocatalyst. International Journal of Nanoscience and Nanotechnology, 11(4), 289-293. M. Mirzaei; H. Ahadi; M. Shariaty-Niassar; M. Akbari. "Fabrication and Characterization of Visible Light active Fe-TiO2 Nanocomposites as Nanophotocatalyst". 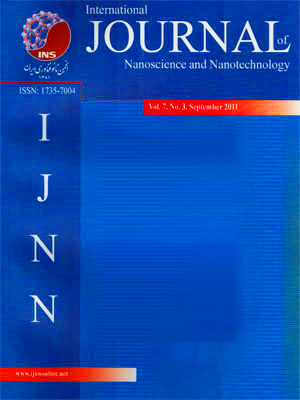 International Journal of Nanoscience and Nanotechnology, 11, 4, 2015, 289-293. Mirzaei, M., Ahadi, H., Shariaty-Niassar, M., Akbari, M. (2015). 'Fabrication and Characterization of Visible Light active Fe-TiO2 Nanocomposites as Nanophotocatalyst', International Journal of Nanoscience and Nanotechnology, 11(4), pp. 289-293. Mirzaei, M., Ahadi, H., Shariaty-Niassar, M., Akbari, M. Fabrication and Characterization of Visible Light active Fe-TiO2 Nanocomposites as Nanophotocatalyst. International Journal of Nanoscience and Nanotechnology, 2015; 11(4): 289-293. In this research Fe-TiO2 nanocomposites with different molar ratios of Fe/Ti were prepared as nano-photocatalyst using a modified Sol-Gel process at ambient temperature. Crystallographic properties of nanocomposites were characterized by X-ray Diffraction (XRD). Surface morphology and mean particle size of nanocomposites were specified by Field Emission Scanning Electron Microscopy (FESEM) and light absorption spectrum of nanocomposites was evaluated by Diffuse Reflectance Spectra (DRS). XRD patterns revealed that Fe3+ is successfully substituted by Ti4+ in TiO2 lattice and no rutile phase is present in nanocomposites. From FESEM images it was specified that mean particle size of nanocomposites changed in the range of 28-47nm and narrow size distribution was seen. DRS analysis represented that by doping of Fe into the TiO2 lattice, light absorption spectrum of TiO2 shifted to visible light spectrum and led to decrement in energy band gap of TiO2.Band gap of nano-photocatalysts was in the range of 1.98-2.89 eV.